‘Popitha’ love good quality toys and these certainly don’t disappoint. Every little pair of arms loves to be wrapped around a soft toy, my two especially. Over the last month they have really become attached to their cuddly toys and Tabitha will demand she has at least 6 in her cot every night! Our soft toys are also used a lot when we indulge in role play. We bring them to life and they become real characters in our tea shop, or at the market. The girls love to have conversations with them and it allows me, the adult to model new vocabulary with them. We came across ‘One Hundred Toys’ by accident one day but I was intrigued by the company so I took a look. The company is all about finding products to enhance not only your child’s development but working with adults. With their teaching backgrounds, they understand parents, and want to support them on their child’s learning journey too. One Hundred Toys believe that childhood should be filled with rich experiences and positive relationships. Toys are only a part of the jigsaw, but it is vital that you choose the right ones. Maileg is only one of the companies One Hundred Toys deals with. It is a Danish brand who make soft toys. Dorthe Mailil, is a Danish designer and illustrator living and working in Herning, Denmark. Maileg toys help children explore the simple wonder of imagination and show playfulness and charm in every last detail. The offer beautiful accessories and settings to be collected, cherished and shared with friends and family for generations. The attention to detail in her products is beautiful and all fabrics are all natural. Each item of clothing can be taken off and put back on again by tiny fingers. This uses the child’s fine motor skills and develops the muscles in their hands which prepares little ones for writing later on. The twins love taking the bunnies clothes off although they are a little tricky to get back on at the moment. They aren’t two yet! This range is perfect for any little boy or girl to cherish. They would play the perfect bunny role at the garden picnic or comfort a child’s to sleep. To purchase anything from the Maileg range, please visit One Hundred Toys (www.onehundredtoys.com) where you can see the full range. **Disclaimer – I was provided with the Maileg Bunnies free of charge for the purpose of this review. However, all photos, thoughts and opinions are my own. Oh aren’t these beautiful! I love more traditional toys like this! Oh my goodness, they look adorable! My husban’s niece would absolutely love these. So adorable. 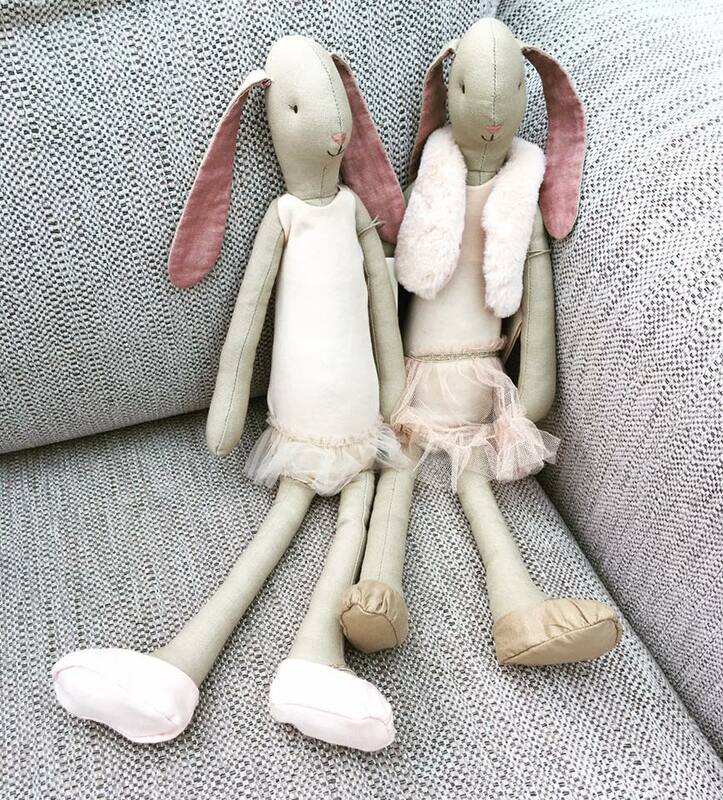 What gorgeous bunnies, they would make such wonderful gifts! these look lovely, i love how simple the bunnies are, compared to all the bright colours of other toys! Oh I love these! They’re so cute. May have to pop one onto my girls’ christmas lists. If you pop over to my Facebook page, you can get a 10% discount too!